It was a dark rainy night walking down a forest trail when the flashlight picked up shiny spots on the path. A quick sprint over and it was clear we had found Hong Kong’s only Boiga, the Large Spotted Cat Snake! Finding this species on the path was quite lucky since the Cat Snake is very at home in the trees as a semi arboreal species. In fact each of the four Cats Snakes we have found this year were on the ground which leads us to believe they must be virtually impossible to find in the trees given their camouflage. 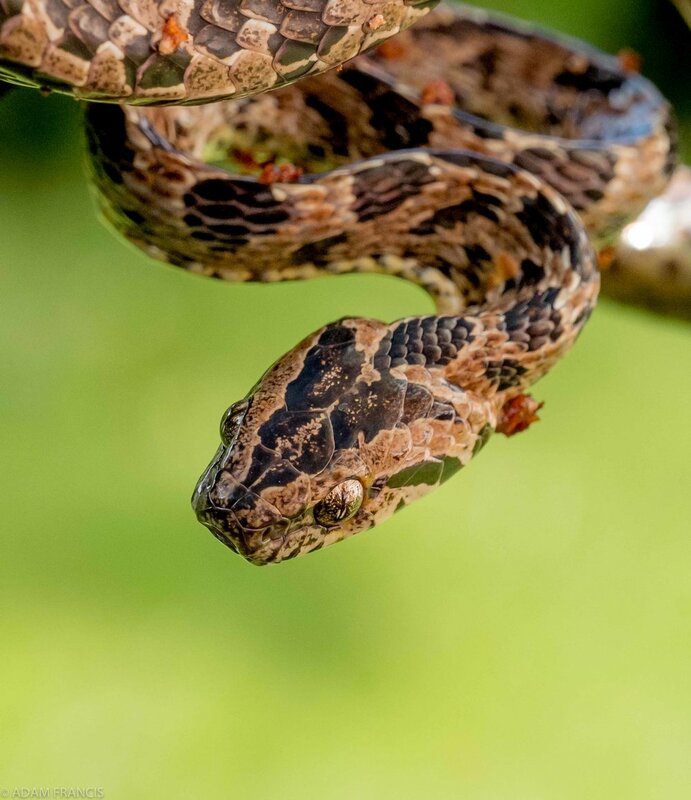 Speaking of their camouflage, it is just one of the many interesting things about this endemic species each of which we’ll explore in this Snake Diary. Starting with the camouflage, as you can see from the image above, the Large Spotted Cat Snake is the only species in Hong Kong to exhibit large discernible spots running the length of the body with the possible exception of the Burmese Python depending how you categorize its markings. As with many snakes markings when viewed in the open its not always clear how effective they are as camouflage but once seen in their native environment the Cat Snakes spots help break up their profile and let them melt into the forest, which is probably why we only find them when they happen to be out in the open. 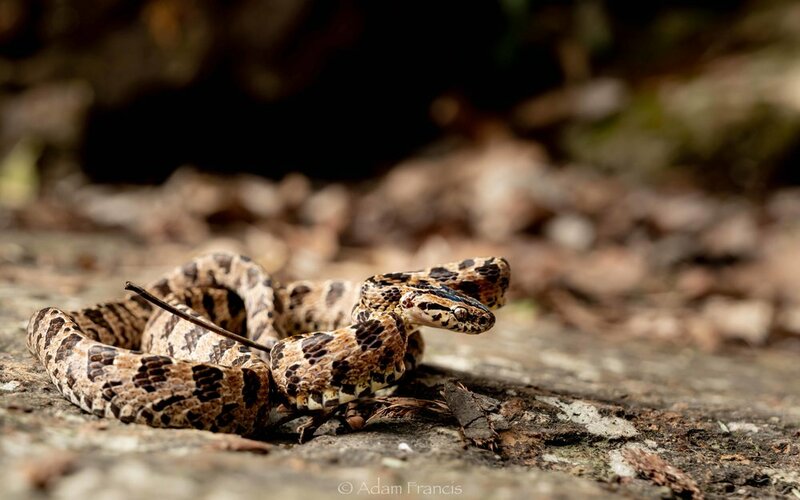 In addition to helping them blend in it is possible that their markings are also partially a mimic of a venomous species, in particular the Pointed Scale Viper which is rare but does exist in Hong Kong. The Cat Snake adds to this possible defensive tactic by flattening its head to appear like a viper when threatened, and despite being technically venomous they are not dangerous to humans or large predators so this behavior could be considered a mimic or false threat in nature. To round off their venomous snake fakery they will also twist up into the standard ‘S’ position and strike readily at their would be attackers with largely false strikes. This species is also largely nocturnal and rarely seen during the day time. We have observed them from early evening just after dusk through midnight, and sometimes later. They seem to locate near water sources but not necessarily and we have seen them eating geckos, though there are documented cases of them also eating other small lizards and even small frogs. When attacking prey they bite and hold on whilst constricting as they chew in order to envenomate with their rear fangs. As a semi arboreal snake their bodies are fit for purpose with long slender necks and long thin tails. This long slender frame helps them extend their bodies to move between branches when climbing or up into bushes or small trees from the ground. The Large Spotted Cat Snake is the only representative of its genus in Hong Kong and is a charming addition to the many other species that call the Island Nation home. Due to its great camouflage and nocturnal nature it is not likely to be seen by the casual observer but should you encounter one on the trails they surely won’t disappoint! For more information on this species stop by the ‘Large Spotted Cat Snake’ page on www.HongKongSnakeID.com.